Trey Brewer and Shiloh Dudley pose before embarking on their cross country flight. According to videos posted to their YouTube channel before the flight took place, they plan to share “the good, the bad & the ugly” of their exciting trip. Their only set-in-stone plan is to stop off in the music capitol of the US, Nashville — Both friends are talented musicians — the rest of their trip will be planned by the day. The pair plan to stop at various points of interest along the way, showing the world the unexpected places that can be accessed by aircraft. The stops will include cities, remote airstrips, national parks, and potentially some off-airport landing sites. Camping will be a huge part of their adventure. Their final destination is Talkeetna, Alaska – a small town where Dudley has a summer job, working with Talkeetna Air Taxi. It was here, on year ago, that he purchased his Scout. The Scout had been flying in Alaska with the National Park Service, but when it started making metal in the engine, the craft was auctioned off on a government website. 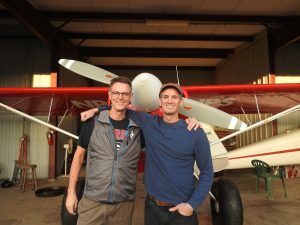 Dudley bought the plane and hauled it back to Talkeetna, where he spent the summer working on the engine between flights, culminating in a complete overhaul. Brewer, who has been a pilot since 1981, also owns his own aircraft. Well actually, he owns two! Brewer is a partner in an Aeronca Champ, but is looking to sell it due to his recent purchase of a Glastar. The two have been friends for about four years and they plan to upload a video after every leg of the flight. They pair are using footage from a GoPro Hero 4, both of their iPhones and a regular camera which shoots both video & stills. “We hope that friends, family, other aviators, and travelers will stay connected with us along the way by subscribing to our YouTube channel, Aviation Overland Adventures,” Brewer hoped, noting that his students at St. Augustine High School plan to follow their journey. If you’ve ever dreamed of embarking on a similar journey – we can help you find your perfect plane! Our huge inventory of used aircraft offers a wide variety of choices for even the most demanding buyers. Our full-time sales team can help you find the right plane for your needs at a price you’re comfortable with. Call us today at 757-724-6047 to see how we can help get you up in the air!